Unadon is a Japanese dish that can be bought from fast food stores and made at home at equal ease. Much like burgers in the Western world, Japanese have restaurants with Unadon that offer various spices and sauces. 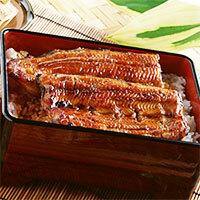 This meal is pretty simple to make - it's steamed rice with grilled eel fillets. Eel meat is saturated with vitamins and minerals. Vitamins A, B and D, and all of the important minerals for your bones and your central nervous system are present - sodium, potassium, calcium, iron, zinc, iodine and selenium, all of these will energize your body. Eel's meat goes very well with various sauces, so you can enjoy it however you want it. Spicy, sweet or something in between. Just be aware that this dish is much richer in carbs than usual seafood dishes. The calories in Unadon per 353g(1 serving) is 688 calories. Unadon is calculated to be 195Cal per 100 grams making 80Cal equivalent to 41.03g with 108.05g of mostly carbohydrates、23.4g of protein、15.5g of fat in 353g while being rich in vitamins and minerals such as Molybdenum and Vitamin D.